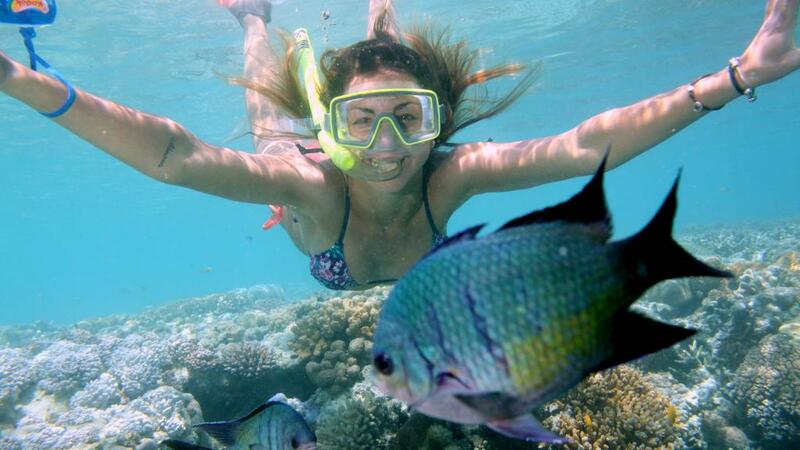 Miss Universe Australia Caris Tiivel is joining the fight to protect the World Heritage listed Great Barrier Reef and is using her platform in the global beauty pageant to take a stand. The Perth model used the reef as inspiration for the unique design of her 'national costume' and Miss Universe Australia dress. Despite best intentions behind the dress, the design immediately divided critics. Unveiling the dress as her 'national costume' for the Miss Universe final, 23 year-old Tiivel was happy to have everyone talking. Whether good or bad, the feedback on the gown was drawing attention to the importance of the Great Barrier Reef. Designed by Perth fashion designer Steph Audino, the dress was created to resemble the famous Great Barrier Reef and features a hand-beaded jumpsuit that represents the textures and colours of the coral as well as an impressive overlay skirt that uses 100m of fabric to portray the waves of the ocean. Taking a stand against the issues that are affecting the Great Barrier Reef, Ms Tiivel hopes to put pressure on politicians both in Australia and overseas. Aiming to catch the attention of world leaders willing to address the issue of protecting the reef, Tiivel was spurred into action following the severe bleaching event that the reef experienced. Hosting the 2017 Miss Universe Queensland registration event from Brisbane, she said that while it's nice to have a story behind your national costume, she really just wanted to raise awareness of the coral bleaching that is occurring. With debate about coral bleaching effects already dividing the nation, her political stand is set to spark controversy. However she assures that the move is not just a publicity stunt, but a cause that is close to her heart. "The Great Barrier Reef is the largest living structure in the world ... so it's important to keep it going for future generations" she said. The dress is just one of four outfits Caris Tiivel will wear at the Miss Universe final in the Philippines on January 30. Although she has not yet visited the reef, Ms Tiivel will travel to the Philippines to begin fulfilling event commitments. Australia has a great track record at the Miss Universe pageant with Jennifer Hawkins winning a second crown for Australia in 2004 as well as success stories Jesinta Campbell, Monika Radulovic, Rachael Finch and Renae Ayris all getting their start at the international pageant.